Our first couple of winter-style storms blew through recently. Had a chance to observe the effects on portable chicken coop. There was no issue with the coop trying to turn into a kite via the tarp and sail off. But I found that if I added another section of tarp on the SW corner (the direction our storms come from), it served two purposes. 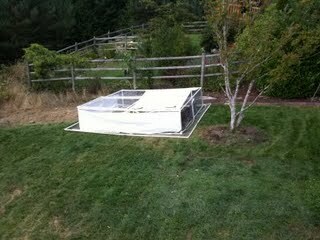 The new tarp both stops the strong storm wind from chilling the chickens and also provides shade for the longer days of late summer, when the sun can still get quite hot. In anticipation of our 15 birds beginning to lay eggs for the first time, we also added a few “nest boxes” to the coop as well. These are simply upside down 5 gallon buckets with doors cut into them. Sand + dichotomous earth on the bottom gives enough weight to keep the buckets upright. The spikes on top keep the chickens from roosting and pooping all over them. I admitted defeat and used store-bought spikes after trying twice to make my own from bamboo sticks.